For our Valentine's date, we spent a quiet evening at home. We were both tired, spending all our weekends lately finishing the floors on the main level. Going into a project like that, with no hired help, you have an inkling of how hard and time-consuming it's going to be, but it doesn't really sink in until halfway through, when you just want to be done already, but there's still so much left to do. As of today, though, the floors are finally done! All that's left is to finish installing the baseboards and trim, as well as to work on a project for the kitchen. My husband is building a custom counter and cabinet to replace the railing that divided the split level between the kitchen and living room, and it will be a great storage solution as well as extension of counter space in the kitchen. And then, I dare say, we might be finished with the renovations inside the house... We've been working so hard for the past 14 months, making so many improvements, and it might be time for a break. To just live here, breathe, and enjoy the beautiful home we've created. Maybe get back to cooking some elaborate Friday night dinners like we did when we first met. In spite of working so hard that day, my husband ran out for groceries while I fell asleep on the couch. And when I woke up, he had made steamed mussels and lamb tikka masala for dinner. 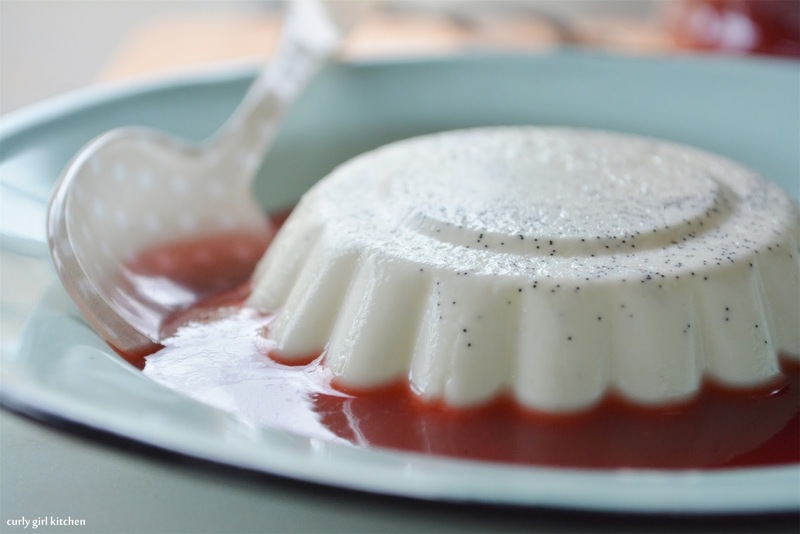 My contribution was this white chocolate vanilla bean panna cotta. 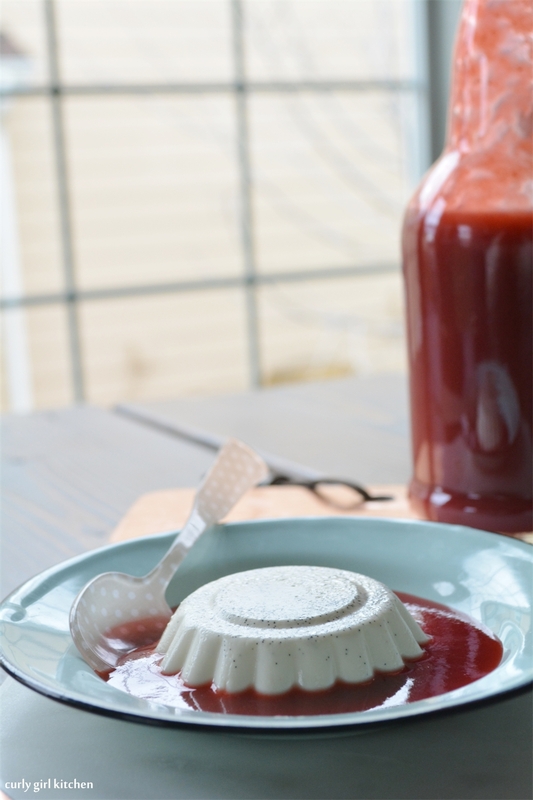 So simple to make, panna cotta is an eggless custard that's thickened with gelatin and looks lovely turned out of a molded tartlet pan. Speckled with fragrant vanilla beans, it was so creamy and smooth, sweetened only with the white chocolate. 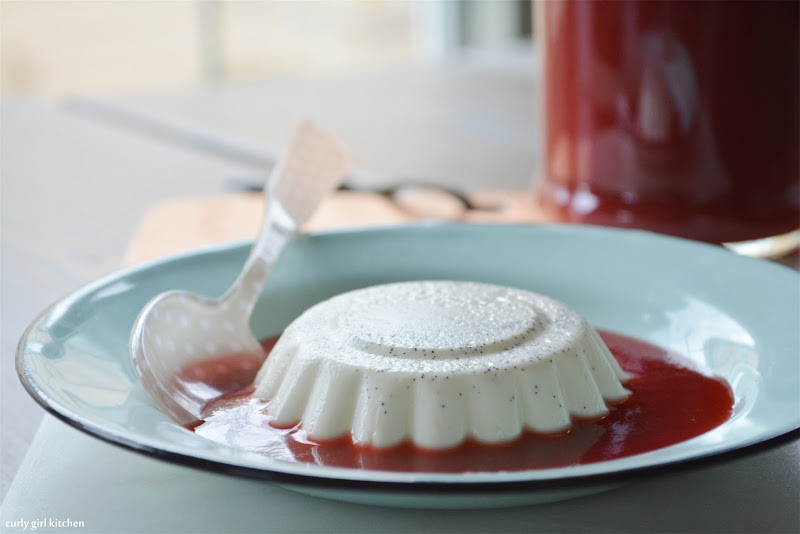 We ate the panna cotta that night with a berry sauce that I'd made from frozen rhubarb, raspberries and strawberries, but when Jamie ate the rest of the panna cotta over the next few days, he topped it with caramel sauce. Combine the cream and milk; pour into a saucepan, reserving 1/4 cup. Stir the gelatin into the reserved 1/4 cup and let stand for 5 minutes. Set the saucepan over medium low heat and warm the cream/milk until hot. Stir in the gelatin mixture to dissolve. 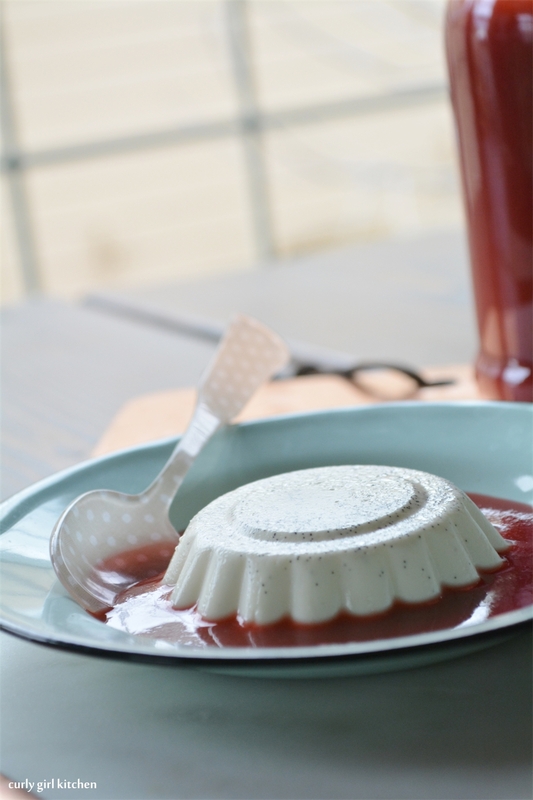 Remove from the heat and stir in the chopped white chocolate and vanilla bean paste until smooth. If any lumps remain, pour through a fine mesh strainer. 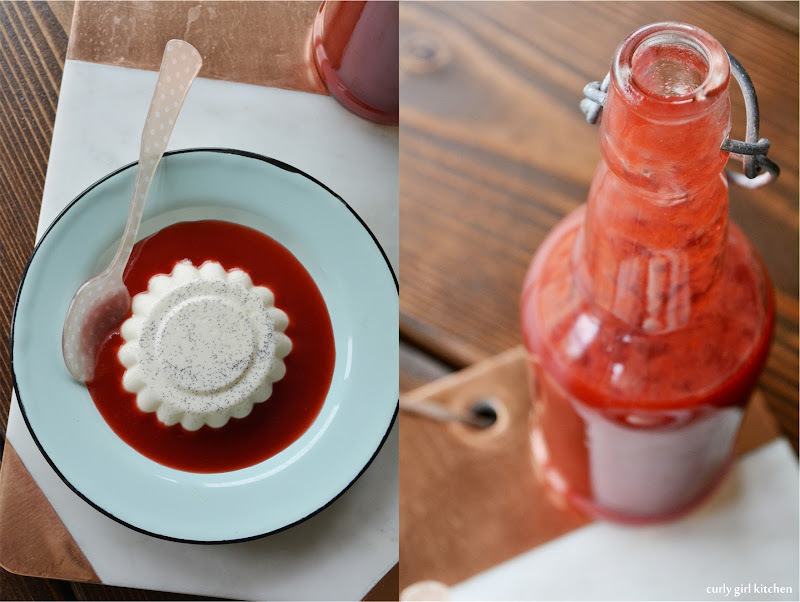 Pour the liquid into 6 molds, ramekins or parfait glasses, and refrigerate until set, about 6-8 hours, or overnight. 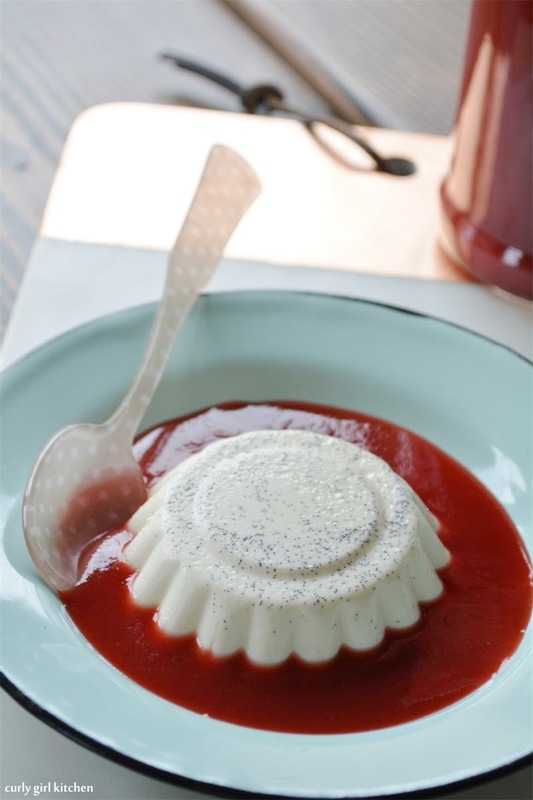 Serve with any kind of sauce you like, such as caramel, chocolate or berry, or just fresh berries.